I’ll leave it to others to explain the origins of the pagan and popular Easter activity known as the “Easter Egg Hunt”. Suffice it to say that it is enjoyed around the world by children of all ages. Almost every city, every town, and every county across the United States hosts an annual Easter Egg Hunt. Neighbors gather together in playgrounds and families congregate in back yards. Whether large and public such as the long-standing (since 1878) White House Easter Egg Roll, typically attended by Presidents and their families, or a smaller and more intimate event, the Easter holiday would not be complete without an Easter Egg Hunt. Easter Egg Hunt events usually involve more than just scavenging for hidden eggs. Often there are other “egg-related” games and activities such as: Easter Egg Rolls, Easter Egg Toss, Egg and Spoon Race and Easter Egg Decorating. Larger events might include music and other entertainment, face painting, arts & crafts, balloon animals, petting zoos (with an emphasis on bunnies! ), story-telling and perhaps a visit from the Easter Bunny him- (or her-) self! Younger children should be separated lest they be run over by the more aggressive older kids, and for the little ones, you can hide the Easter Eggs in more obvious and easy-to-get-to places. You could also make a trail of Easter Bunny foot prints for the youngest kids to hop-along to bring them directly to the Easter Egg’s secret hiding places. Children of all ages will prefer Easter Eggs that are not real, but are chocolate or plastic with treats inside (think small candies or coins). When planning an Easter Egg Hunt for mixed age groups, be sure to include at least a few other activities that will be appropriate for different age groups. For example, competitive games, such as the ones listed above, are fun for most older kids, but not fitting for toddlers, who may enjoy face painting more. For Easter Egg decorating, keep it simple for the younger ones with a few dye baths already prepared and some stickers. For older children, you can supply paintbrushes and variety of items to glue on. Older kids will be more interested in participating in an Easter Egg Hunt if the pursuit takes more effort, so hide the eggs in some harder to find, more out of the way places and vary the locations from ground level to eye level and above. Tweens are better able to work as a group. Divide into teams and provide each with a different “map” to find the hidden eggs. Or hide Easter eggs of different colors and then give each team a color to collect. Provide prizes for the teams who find all of their hidden eggs, and/or a special grand prize for the one person who finds the unique egg (often the “Golden” Egg). Another way to make an Easter Egg Hunt different and more fun for tweens is to make it at night. Organize it for the Saturday night before Easter Sunday. Have people bring their own flashlights (or cell phones!) and their own containers. Adults can really enjoy with an Easter Egg party. Everything can be elevated! Easter Egg decorating can be an art form. Even so, I doubt just anyone could paint an Easter Egg like the ones we have in our Easter Baskets at Manhattan Fruitier! 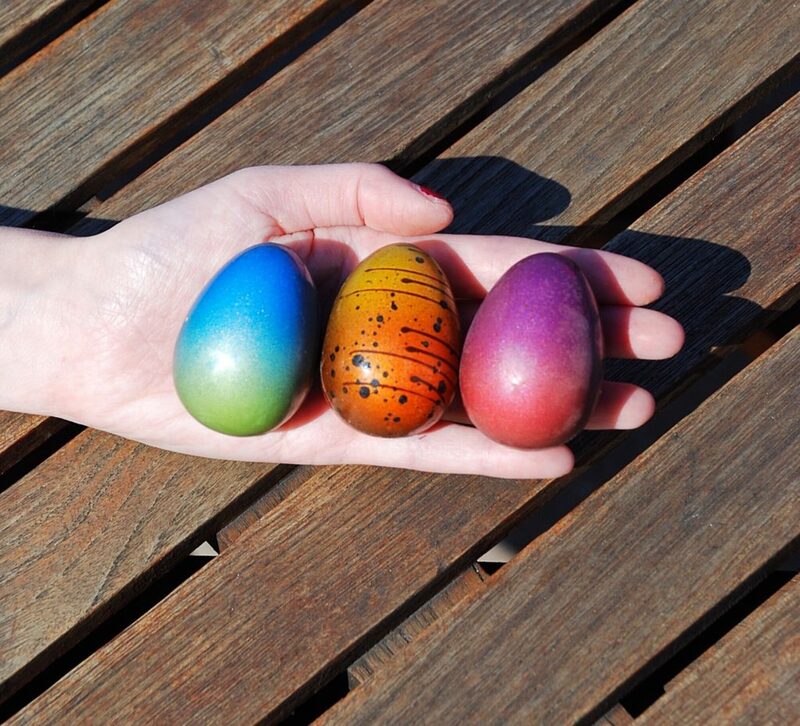 Christopher Paume hand-paints these praline filled chocolate eggs so that the uniquely blended colors shine like gemstones, and the speckling patterns are drawn from nature. You may have a hard time biting into these beauties! Be sure to set up all the Easter Egg games. Adults love having the opportunity to act like kids. Everyone will want to participate. In between egg-related races, you can sip on mimosas — perfect for a Sunday brunch party — and other nibbles that are more substantial and more interesting than the fare you would find at a kids party. For dessert, perhaps a carrot cake is called for! Kids love to get their hands dirty. So another fun activity for an adult Easter Egg party might be making chocolate Easter Eggs or chocolate Easter Bunnies. There are a plethora of recipes readily available on the internet. You’d have to be willing to give over your kitchen to the potential mess, but your guests will certainly remember the occasion. If you aren’t up for a party this year, you can always celebrate the Easter holiday buy sending (or treating yourself to) one of our Easter baskets designed to please kids, tweens and adults alike! 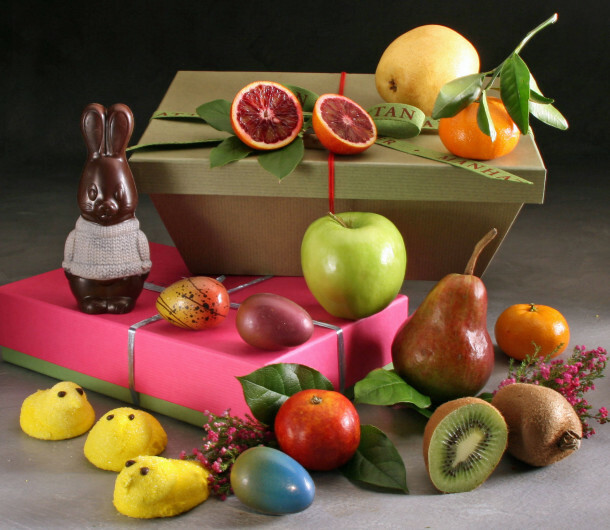 We offer adorable artisanal peeps made by Duane Park Patisserie, chocolate bunnies keeping warm in their charming “sweaters”, and the hand-painted Easter Eggs with fruit in two sizes: choose Hippity or Hoppity! Or you can order any of the Easter-themed items alone. St. Patrick’s Day is observed on March 17th, the day that St. Patrick died in 461 AD. This holiday celebrates the introduction of Christianity (specifically Catholicism) to Ireland as well as Irish culture, folklore and traditions. Originally a holiday celebrated only by the Irish, today St. Patrick’s Day has become a multi-national festival. People from all backgrounds turn out for their town’s annual St. Paddy’s Day parades and join in on other holiday traditions such as hanging out in Irish pubs to drink Irish beer and Irish whiskey; eating Irish dishes such as Irish Soda Bread, Shepherd’s Pie, or Colcannon; listening to traditional Irish folk music; singing Irish ballads; and wearing green-colored clothes and/or carry shamrocks. St. Patrick’s Day is also known as “Roman Catholic Feast Day or “The Feast of St. Patrick”. Interestingly, March 17th falls smack dab in the middle of the Catholic religious season of lent (between Ash Wednesday and Holy Saturday before Easter Sunday) when excessive drinking and feasting is strongly discouraged if not prohibited. Historically, these sanctions were lifted for St. Patrick’s Day which may have contributed to this holiday being known as a raucous daytime party with happy drunken revelers! We never miss an opportunity to create a gift for a specific holiday, and St. Patrick’s Day is no exception! 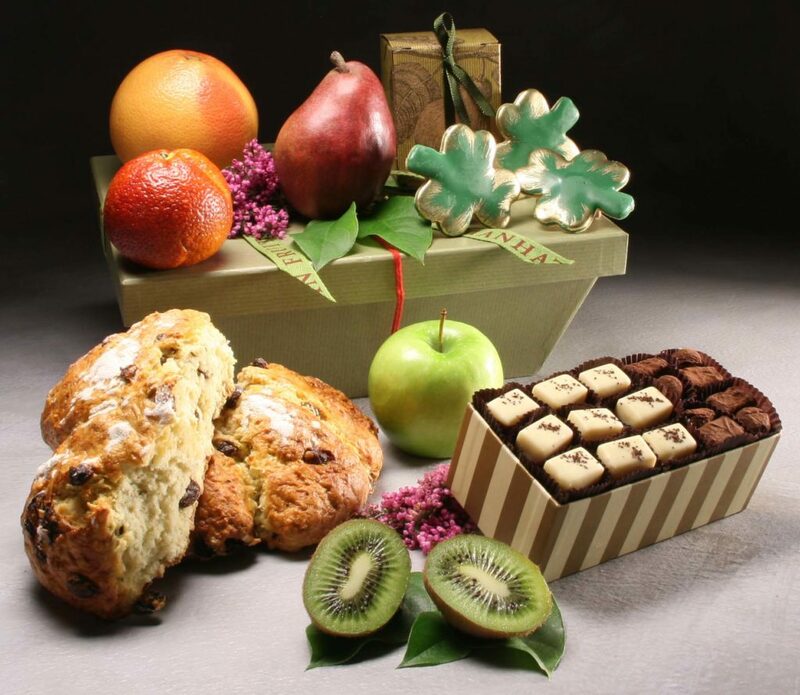 Building on the themes of this Irish tradition, we paired our fresh fruit hamper — well, we are a Fruitier after all — with a charming green and gold Shamrock Cookie Trio from our beloved Duane Park Patisserie and an authentic Irish Soda Bread made by our friend Amy from Amy’s Bread. We call this St. Patrick’s Day gift our “Luck of the Irish”. If you are looking for a “Pot of Gold” then we can add a delectable box of three types of chocolate treats: Irish whiskey truffles, Irish coffee bonbons, and Irish cream truffles (see photo below). Delight your Irish friends and family with our “Pot of Gold” St. Patrick’s Day gift! St. Patrick was a real saint, although never actually canonized by a pope. Still, he became the biggest saint in Ireland and he wasn’t even Irish! He was born in Britain around 385 AD and it is said that his real name was Maewyn Succat. When he was 16 years old, he was captured by the Irish and taken to Ireland where he worked for 6 years as a shepherd. During the time of his enslavement, he found God, made his way back home and studied for the priesthood. Later he returned to Ireland as a missionary and changed his name to Patricious (or “Patrick”) derived from the Latin for “Father Figure”. In Ireland he converted many Druid’s, who worshiped nature and harmony with the earth, to Christianity. St. Patrick is renowned for “driving the snakes out of Ireland”: a metaphor for ridding the country of pagan religions. Factually, there are no snakes in Ireland! St. Patrick is also closely associated with the shamrock, so we had to include Shamrock cookies in our St. Patrick’s Day gifts! Legend has it that St. Patrick used the three-leafed clover to illustrate the Holy Trinity — the God, the Son and the Holy Spirit as three parts of a whole –- to the uninitiated. In statues and other imagery, St. Patrick is often shown holding a posy of shamrocks in his hand. Drinking Irish whiskey or Irish beer in Irish pubs is a time-honored activity on St. Patricks Day. Many bars open early so the drinking often begins first thing in the morning and extends through-out the day! We couldn’t imagine creating a St. Patrick’s Day gift that didn’t have a nod to Irish whiskey, Irish coffee and Irish cream. Wearing green on this day is a ritual that is followed by people of Irish heritage and non-Irish heritage alike. Green is the color associated with Catholics in Ireland (orange for Protestants) and Irish folklore says that wearing green can hide you from the mischievous fairies known as leprechauns who will pinch you if they can see you. Even today people not wearing green on St. Paddy’s Day are risking a pinch from a passer-by! Next to the potato, Irish soda bread is probably the most recognizable Irish food around and would be included in any traditional St. Patrick’s Day feast. Amy’s Irish soda bread is deliciously light, flaky and not too sweet. Made with the classic ingredients of buttermilk, caraway seeds and raisins, this round soda bread loaf adds another Irish-inspired element to our St. Patrick’s Day gifts. The largest wave of Irish immigration occurred of course shortly after the devastating potato famine. About 2 million Irish people who were able to escape the starvation and disease, immigrated to the United States shores beginning around 1845. Today there are over 30 million people in the United States who are of Irish descent. So it’s no wonder that St. Patrick’s Day has grown to be a national celebration. In Chicago, the city dyes the Chicago River green! It only lasts a few hours but it must be a sight to behold! Here in New York City, the renowned St. Patrick’s Day parade, official since 1848, draws millions of people. That’s why they say, “On St. Patrick’s Day, everybody’s Irish”. March 14th is coming up and 3/14 = 3.14 = the first three digits of Pi = Pi Day! This date isn’t just revered among math nerds and science geeks. Ever since National Pi Day in 2015, when the date was 3/14/15, or represented the first five numbers of pi (and even more if you considered the time of day, morning and night, which many people did: 3.1415(9:26:53 or 9:26 and 53 seconds! ), awareness of pi day has increased. As a result, pi day has grown in popularity beyond the cloistered halls of math, science, engineering and physics. 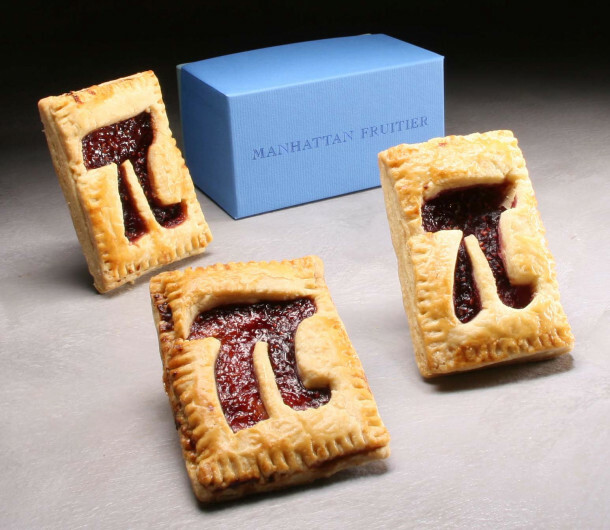 Of course we at Manhattan Fruitier had to jump on the bandwagon too and find a way to make Pi Day more fun! Our Pi Pies are made exclusively for Manhattan Fruitier by the wonderful bakers at Sweet Leaf Bakery in Long Island City! We put three Pi Pies in our adorable “blue box” for a delightful surprise on your Pi lover’s doorstep. Hand held Pi Pies for Pi Day! Sweet Leaf has a small commercial kitchen so we aren’t able to request very many Pi Pies. We get one delivery right before Pi Day so don’t wait too long to order or you will be out of luck and your Pi Day celebration won’t be nearly as merry. Here in the United States, children learn about pi in geometry classes which usually begin in 6th or 7th grade (unless you are advanced!) For those of you who may need a refresher, pi is the number you get every single time you divide the circumference of a circle by its diameter. It doesn’t matter the size of the circle: the result will always equal 3.1415926535897…..!! That’s pretty remarkable! Pi was calculated and has been used since the earliest known ancient civilization of Mesopotamia, somewhere between 3800 to 3200 BCE, when the wheel was invented. Pi is also what is called an “irrational” number which means that it cannot be expressed as a fraction and the number of decimal places is infinite. The symbol for pi (π) is the 16th letter of the Greek alphabet and was chosen in the early 1700s because it is an abbreviation for the Greek word for “perimeter”. Pi is fairly ubiquitous: it is used as a constant in formulas in math, physics, engineering and architecture, and the natural biological sciences as well. The fascinating story of Esther begins in that part of the world that we now know as Iran, during the Achaemenid Dynasty of the Persian Empire, around the 4th century BCE. By that time, the Jewish diaspora was well established and groups of exiles could be found living in Persia. Esther’s parents were dead, and she was raised by her older cousin, Mordecai, who was like a father to her. 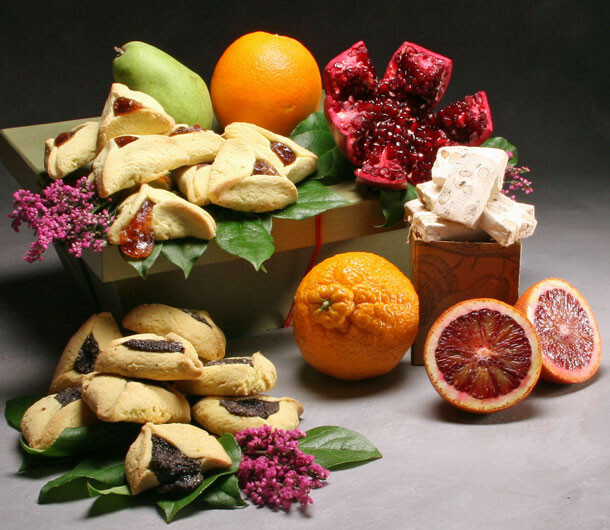 Her story is found in the Old Testament of the Bible in the Book of Esther and it narrates the origins of the holiday of Purim. The Persian empire was ruled by King Ahasuerus who was looking for a new beautiful wife. Reluctantly, Esther was included in the group of young women to be considered. The king immediately fell for her, and she was made queen, all the while keeping the fact that she was Jewish hidden from him. One day, Mordecai overheard a plot being hatched to murder the king. Mordecai got word to the king and the plot was thwarted sparing the king’s life. Haman, a prime minister of King Ahasuerus, was offended when Mordecai, who was a very proud man, refused to bow to him as was decreed by the king’s order. Haman decided that he would take revenge not just against Mordecai, but against all Jews, by exterminating them. He threw “lots” to determine the lucky day for the massacre, and it was the 13th day of the month of Adar on the Hebrew calendar. Haman told the king of his plans and the king gave him his blessing. Mordecai told Esther that she had to do something to stop this massacre and that she herself would not be safe even though she lived in the royal palace. Esther told Mordecai to gather all the Jews in the area and have them fast for 3 days after which time, she would approach the king. Although she had not been summoned by him, after 3 days Esther bravely went to the king’s chambers with the knowledge that she could be killed for such an unauthorized intrusion. Fortunately, King Ahasuerus was quite happy to see his beautiful queen and asked her what she wanted. She invited the King and his Prime Minister, Haman, to a feast that she had prepared for the next day. At the feast, the king again asked Esther if she had a request and she told him that she would like to invite him and Haman to attend another feast of food and wine the following day and she would make her request then. Haman was very honored to be included in this royal fete. But when he left he saw Mordecai who again would not bow to him and he became furious and was compelled by his advisors to build a gallows to hang Mordecai the next day and to go to the king with his plan. That night, the king was reminded that Mordecai had saved his life and that he had done nothing in return to thank him. When Haman came to ask his permission to hang Mordecai, the king first asked him what he should do to honor someone. Thinking that the king meant how he could honor him, Haman explained that the person should be dressed in royal garments, given a royal horse, and told to ride through the streets of the city proclaiming that he has the special honor of the king. The king rather liked that idea and told Haman to make it so for Mordecai whom he wanted to honor for saving his life. Haman was chagrined, but carried out the kings wishes the next day. After the ceremony, he went to the second feast with the king and queen. Queen Esther revealed to the king that she herself was a Jew and begged him to save her people from the annihilation planned by Haman and incited by his hatred of the Jewish people. When the king discovered that Haman had already built a gallows upon which he planned to hang Mordecai, he declared that “the tables had turned” and Haman himself would be hanged there. More tables turned after that: Mordecai was made Prime Minister and Esther was given Haman’s estate. But the decree Haman had had the king set forth – to exterminate all the Jews – was still in place and could not be removed. Instead, Mordecai and Esther had the king set forth another decree that the Jews could fight against their oppressors. And on the 13th of Adar, the day Haman was to begin his massacre, the Jews fought back and killed their would be murderers including all the sons of Haman. 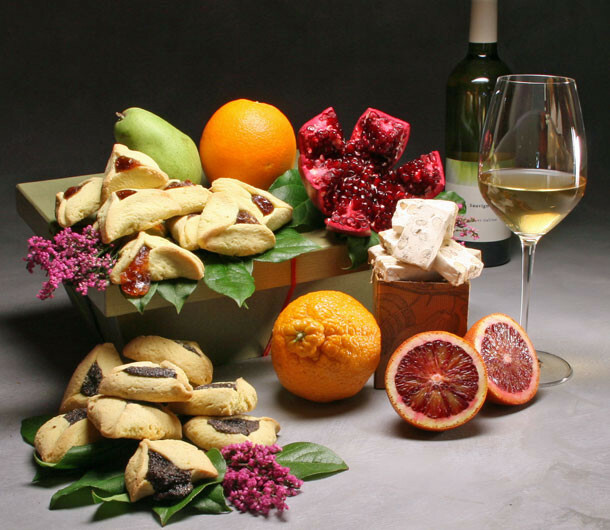 The next day was a big a joyous celebration of freedom that became the holiday of Purim (literally meaning “lots” in Hebrew), on the 14th day of Adar, and is commemorated with feasts of food and wine around the world today.